Google shows its commitment to support SMEs go online by having a new partnership with Kemenperin (Ministry of Industry). The initiative was realized through “Sahabat Go Digital” program, a part of government’s Industrial Revolution 4.0 mission. The program will begin in September 2018. Google team will give one-on-one training for three months to the select Kemperin’s SMEs. The objective is to expand the target market and reach overseas customers. “Google is pleased with the government’s initiative to make digital skills as part of Indonesia 4.0. 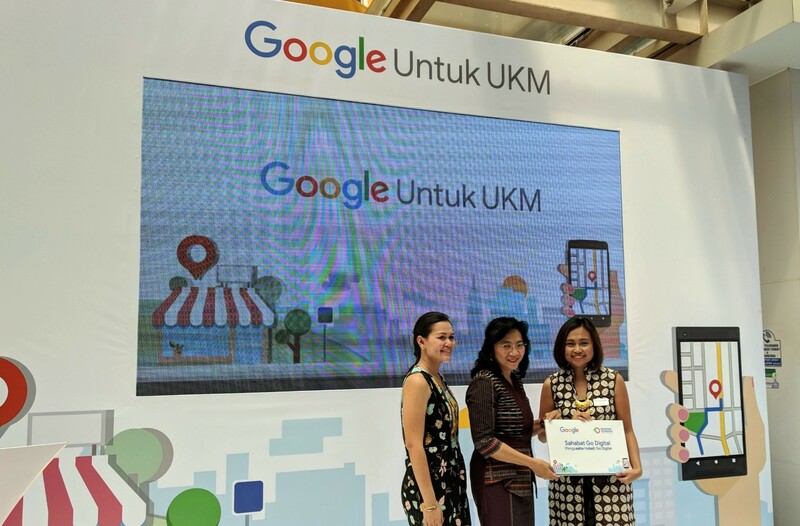 We expect Google to be the right partner for the government to support the realization of this initiative,” Putri Alam, Google Indonesia’s Head of Public Policy & Government Relations, said on Thursday (8/9). Kemenperin have trained 2600 SMEs with five e-commerce companies for the SMEs Go Online program by July 2018. The ministry considers only 4% of the total SMEs are ready to enter the international market. “We’re ready to further educate the 4% because the product has good quality and accepted in the market. The rest needs training, it requires support from other ministries and parties to develop together,” Gati Wibawaningsih, SMEs Director General for Ministry of Industry. Previously, Google has made some similar partnerships with other parties from the government level to private companies. Since Google held the SME training program in 2015, until now, it has trained around 1 million SMEs. Google trains SME owners through a combination of direct and digital, such as Gapura Digital and Womenwill. Gapura Digital has been running since last year and now being presented in 14 locations in 12 cities, including Jakarta, Bandung, Denpasar, Malang, Medan, Surabaya, and Makassar. Classes begin every week, facilitating 40-50 participants. There are 11 modules with 3 hours duration each, the topic is to dig deeper into the digital trends, website creation, and SEO / SEM. Moreover, Womenwill is women entrepreneurs community program, sharing insights and experiences to help them develop by technology. This program was launched last year and available in four cities include Bandung, Surabaya, Semarang, and Bali. Alam added, by going online, the exposure level from SME players can reach four times compare to nothing. It’s seen from the customer’s background that is not only local but also international. Google prepares three tools to support SMEs Go Online program. Starts from the Google My Business app, it can now be downloaded free for business players to manage their business existence online in Google Search and Google Maps. Business players can provide verified business information, facilitate content promotion or special offers, reply to consumer’s reviews, and view real-time analytical data. Therefore, using Primer, an education app for business players and marketers of the summarized marketing and business basics. They can learn 54 lessons in Indonesian, anytime and anywhere within only five minutes. Lastly, testing the business site speed through Test My Site free portal from Google. In this business portal, people can see their site’s speed and step recommendations to improve its performance. “If you can’t come to the class we offer, there are Google Business agents ready to help in providing guidance. There are hundreds [agents] ready to approach business players in 14 cities,” Veronica Utami, Google Indonesia’s Head of Marketing, said.